By Karrar Haider in Internet. Updated on November 1, 2017 . You don’t have to run to the repair shop every time your PC ends up with an issue. Many of the common PC problems have a rather simple solution, and you can fix them yourself with a few simple steps. To help you troubleshoot common PC problems yourself, I have listed 15 most common PC hardware problems and what your options are if you face any of them. A heating PC slows down the whole system and leads to frequent crashes. Additionally, PC components may also get permanently damaged due to constant exposure to heat. There are two main reasons your PC heats up, i.e. either the cooling system isn’t working properly or the PC is heating to the point your cooling system can’t handle it anymore. In either case, I have written a comprehensive article on different solutions to handle an overheating PC. Do check it out. Restarting the PC is the answer to many problems, and it is a common solution to USB port problem as well. Press Windows + R keys and enter devmgmt.msc in the Run dialog to open the Device Manager. Here, expand Universal Serial Bus controllers option. Now right-click the entry USB Host Controller and then click on Uninstall. 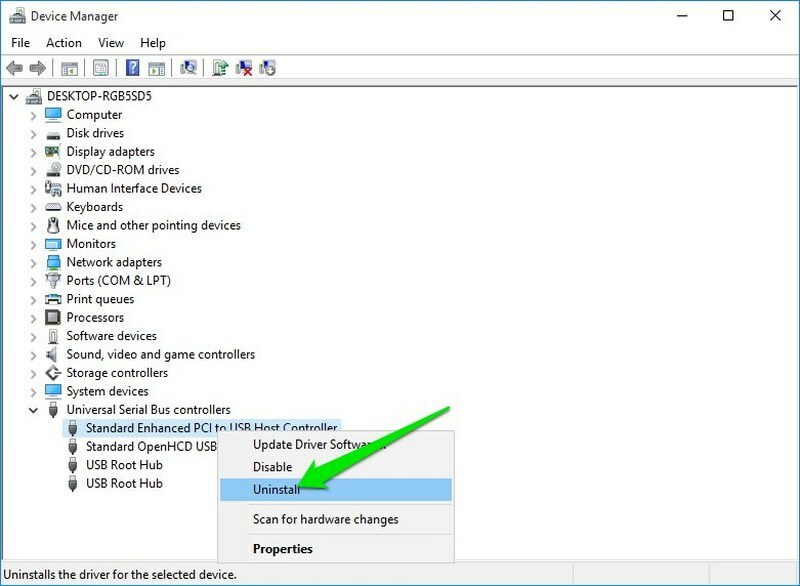 Repeat this for all entries with USB Host Controller to uninstall drivers for all the USB ports. Once deleted, restart the PC and Windows will automatically reinstall the drivers and fix any driver issues. Press Windows + R keys and type powercfg.cpl in the Run dialog to open Windows Power options. Here click on Change plan settings next to your current plan and then click on Change advanced power settings. 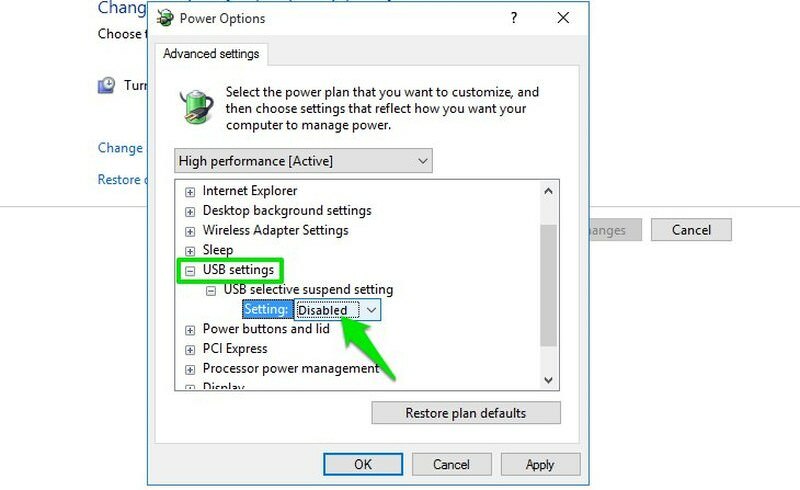 Now, expand USB settings and disable USB selective suspend setting. Restart the PC to see if it fixes the USB port issue. Note: This option should be kept enabled if you want to save battery power. If it doesn’t fix the USB port issue, then enable it again. Go to Advanced settings in the Power Options. 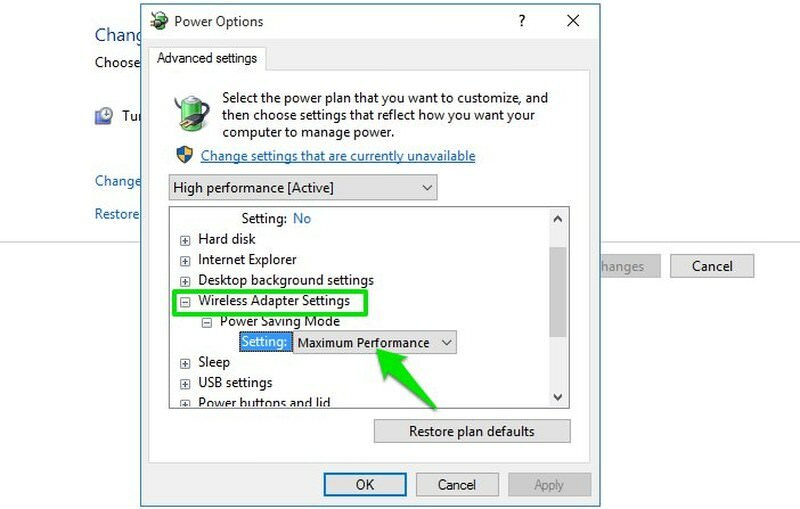 Here expand Wireless Adaptor Settings and then expand Power Saving Mode. Set this to Maximum Performance. The PC motherboard is smart enough to detect problems and sounds beeps in different rhythms to tell you. Here is an article on what it actually means when the PC beeps multiple times. If the PC doesn’t start after the beeps, then it’s usually difficult to solve the problem yourself. However, I’m going to list down two of the most common problems due to which beeps occur, and thankfully, you can solve them yourself as well. Take out the RAM completely and clean any dirt inside the slot using a cotton bud. Now insert back the RAM and put enough pressure on both ends to ensure it is fully inside. Afterward, close the clips and make sure they’re properly locked. Even a slightly loose RAM will be unable to work. A damaged or wrongly installed hardware component could lead to beeps. Take out any newly added hardware components and see if it solves the problem. If the PC works fine afterward, then either get it installed properly or get it fixed (or replaced). If you notice one or more fans in your PC aren’t working, then it could be due to the dirt inside. You will have to open up the PC and use a compressed air can or a leaf blower to clean up the fans and other components. If dirt wasn’t the problem, then you can also use the SpeedFan app to see what is the problem. The app will let you control the fans to make them work again. Although your PC motherboard must support fan control to use this app. Sometimes your PC may not use a portion of RAM. For example, You may have 4GB of RAM, but your PC only uses 2GB when you check it from the Task Manager. This is usually a Windows setting issue. Note: If only a few MBs (200-400MB) of RAM isn’t being utilized, then it’s probably being used by PC hardware and you can’t do anything about it. Press Windows + R keys and type msconfig in the Run dialog to open System Configurations. Move to Boot tab and click on Advanced options. Now check the checkbox next to Maximum memory and enter the maximum amount RAM you have installed (in MBs). Click on OK and restart the PC to let it take effect. 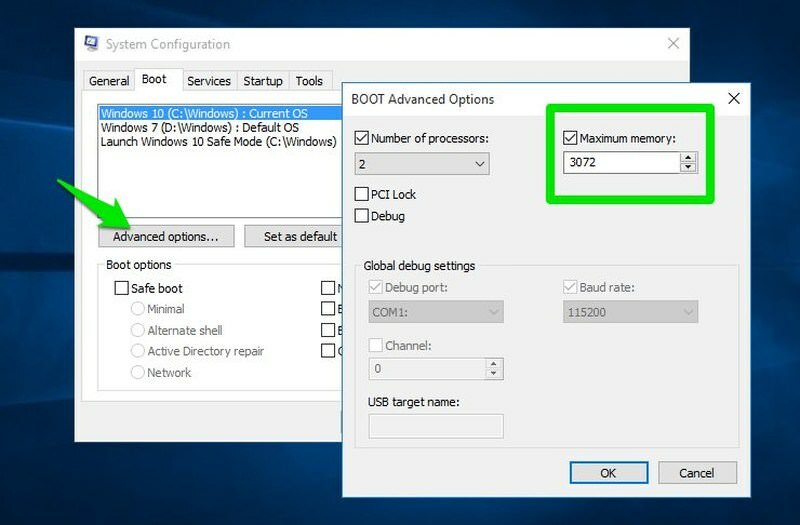 Good to know: While you are at it, you should also check the checkbox next to Number of processors option and ensure your PC is utilizing all the CPU cores as well. Set it to the maximum number if you want to use all of the CPU power. If this didn’t fix the problem, then there is also a chance one of the RAM isn’t installed properly. Try reinstalling it. Your PC fan runs according to how much your PC is heating. The higher the temperature, the faster the fan will run. 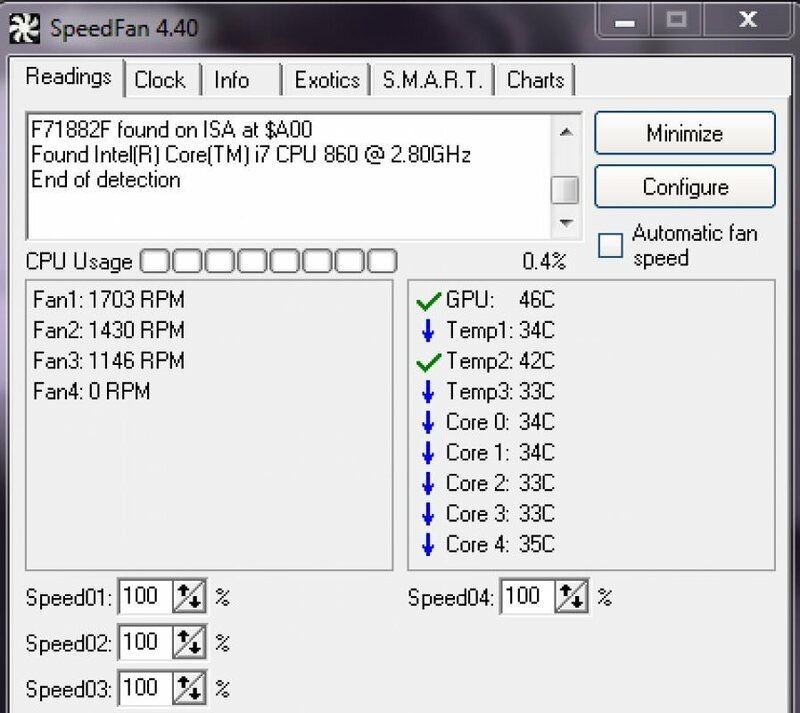 In case your PC temperature is fine (you can use HWMonitor to check it), but the fan is running at full speed; then you’ll have to manually control it. You can use the SpeedFan app for this purpose as well. It will tell you the running speed of all the fans inside your PC so you can manage their speed. Don’t worry about app compatibility, overworking fan problem only happens with motherboards that can control the fans. If your PC only shows manufacturer logo and then crashes right before it was supposed to load the operating system, then it’s a problem with RAM or hard disk. As the OS is unable to load, then either the RAM is corrupted and can’t hold the boot loader or the hard drive is damaged and can’t load data inside it. If you have multiple RAM slots, then taking out each one of them one by one and starting the PC will help find the culprit. In the end, you will have to replace the corrupted RAM or the hard disk, whichever has the issue. If your PC is not powering on at all – not even a single light in it, then it must be a problem with the power source. Desktop users: If your PC’s extension cord, power outlet, and other connections are working fine, then the problem may be with the PC’s power cable. Replace the power cable of the monitor with the CPU’s (if you don’t have a spare) to see if it turns on. You’ll have to get a new power cable if this fixes the problem. Laptop users: Take out the battery and put it back before starting the laptop. If this doesn’t work, then take out the battery again and connect the charging cable to the laptop. Start the PC on charger power and see if it works. You will have to replace the battery if it fixes the problem. Note: You should also remove all types of external devices connected to your PC while trying this. A malfunctioning device might cause this issue. If you hear a lot of extra noise while using the PC, then most probably it is a plea to clean it up. Get it cleaned or use a can of compressed air or leaf blower to clean it up yourself. If you have overclocked your PC GPU and CPU, then they could be the reason for the noise as well. There is also a chance that a disc inside the DVD ROM is making the extra sound. You can check this article about all the PC components that create noise for more information. If you hear clicking or grinding sound from the hard drive, then it might be time to get a new one. Hard drives have a limited lifespan and loud sounds are the main sign of a near hard drive failure. You can use CrystalDiskInfo hard drive monitoring tool to check the health of your hard drive. The tool will tell you the current health of the hard drive with signs like "Good", "Caution" or "Bad". 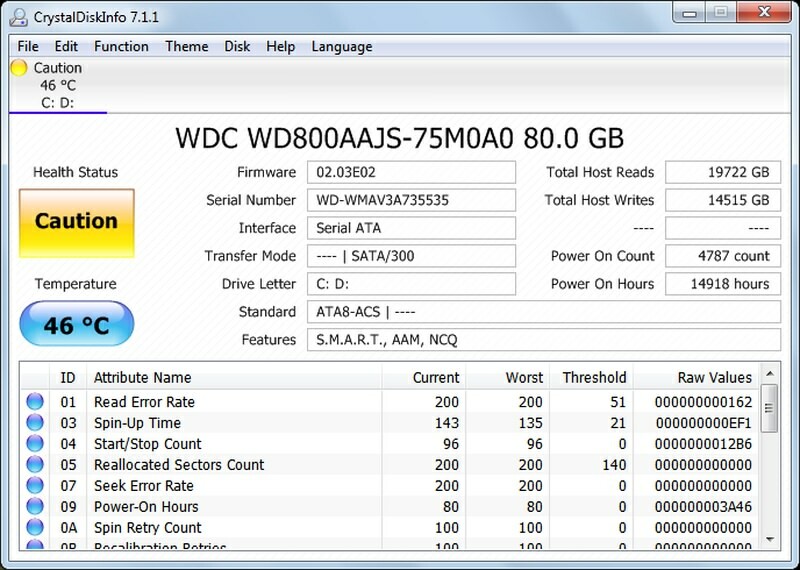 You should back up all your data immediately and try to get another hard disk before this one fails on you. The dreaded Blue Screen of Death (BSOD) can occur due to both software and hardware problems, but usually, it’s a hardware problem. 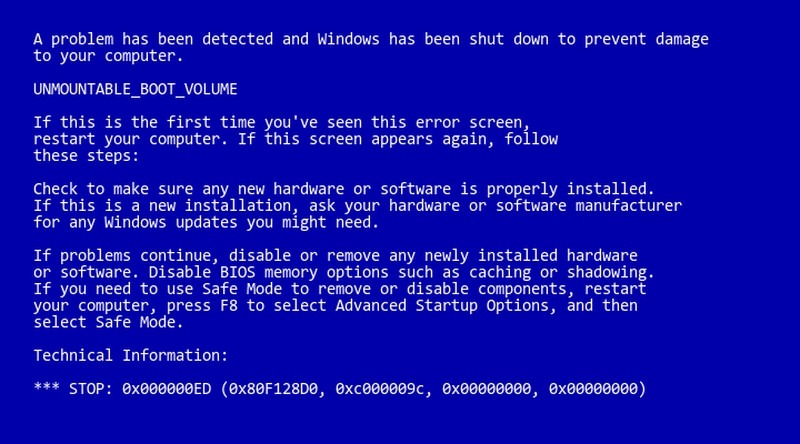 Whatever the cause, BSOD requires immediate attention as it’s a sign of a big problem. BlueScreenView is a great Nirsoft utility that will show important information if you have recently suffered a Blue Screen of Death. You should be able to identify and solve the problem using this information. Below are some common reasons for BSOD and their solutions. Open Device Manager by typing devmgmt.msc in the Run. Here expand each menu and look for a yellow triangle icon next to each driver. 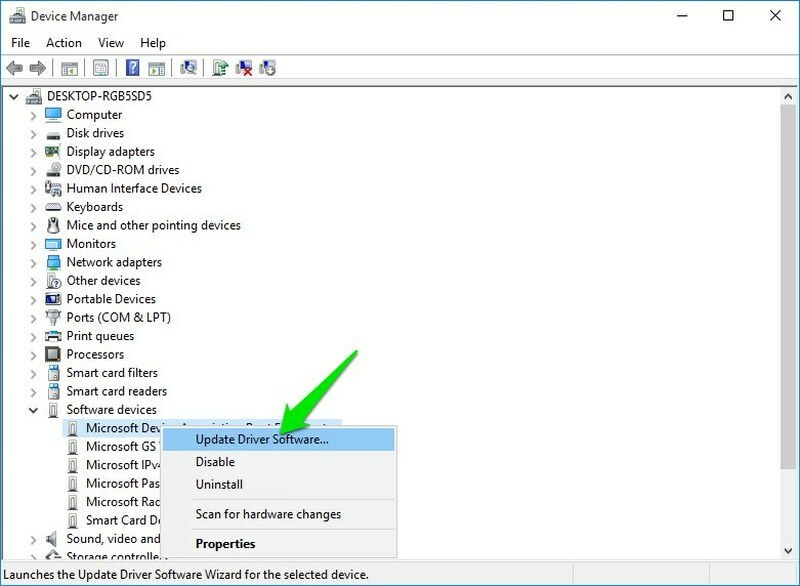 If you find any, right-click on it and select Update Driver Software to update its driver. You can also use a third-party app like IObit Driver Booster to automatically find and fix driver problems. If you open too many programs that RAM can’t handle, then it may freeze the system and show BSOD. For that, you should either stop opening too many programs or upgrade the RAM. BSOD is also a sign of a dying hard disk, use the instructions in problem #11 above to identify hard disk problems. Heating PC also leads to BSOD if too much pressure is put on the components. Use the instruction in problem #1 to solve it. If your monitor isn’t showing anything, then this could be a problem with the monitor itself or the graphics card. You should connect the monitor to another PC to see whether the problem is with the PC or the monitor. If the monitor isn’t powering on at all, then replace the power cable with a working one and see if it helps. Here is a good article on how to fix a monitor that isn’t showing anything. If the monitor goes black after few seconds of display, then it could be a problem with the color quality or screen adjustment. Press the auto-adjust button on your monitor to see if it fixes it. If not, then you will have to change display color from 32bit to 16 bit. You can connect the PC to another monitor to adjust colors from your graphics card settings. Pressing the auto-adjust may show the display for few seconds. You can use this to your advantage and adjust the color while pressing auto-adjust. Open the Control Panel and click on Ease of Access. Here click on Change how your keyboard works button. 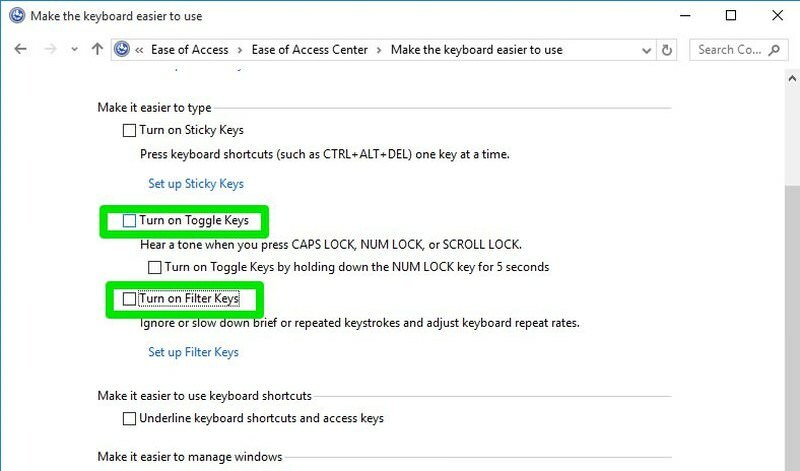 Now uncheck the checkbox next to Toggle keys and Filter Keys to solve this problem. Many of the above hardware problems can be easily fixed by tweaking the settings or using a software. However, some of them will definitely require you to pay a visit to the computer repair shop. It’s good to at least know what is wrong with your PC so you can take the measures accordingly. Do let us know in the comments if you faced any PC hardware problem before and how you solved it.